The Junior General paper soldier site continues to grow. Interestingly, there’s now a selection of free paper terrain available; just search for accessories. I particularly liked the medieval house by Michael Krein and decided to have a go as we need something to represent a village in Field of Glory. One of my efforts is shown above. I’ve made three now and have a further three to do. It took 5-10 minutes to build each one and another 5-10 to paint the folds. It took far longer to do the basing than make the models. Use the thickest card that your printer will allow. The roof is a bit weak in the middle; just where you want to pick them up. Score all folds lightly first before cutting out the main building. Obvious I know but much easier before any cutting than afterwards. The tabs provided with the model are fine but I experimented with larger tabs, needing fewer cuts, to speed up the whole process and strengthen the final model. Be prepared to paint the corners and roof folds as the white card shows through. I used dilute burnt umber. I also washed the roof with dilute burnt umber, and touched up the windows with black, as some of the ink rubbed off the card whilst I was cutting the model out. Use something weighty as a base. In my case I had some circular metal discs given to me my someone who works in washing machine factory where they are scrap. I don’t know how long these will last in the terrain box but at least we’ve now got something; I suppose time will tell. As they are made of paper and scrap they cost very little to replace. 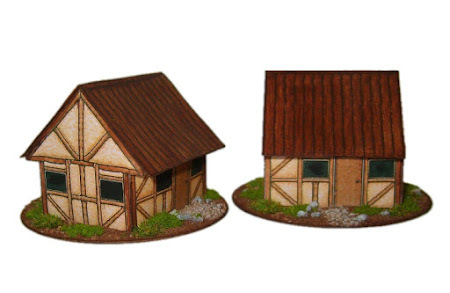 Update: on Sunday I used these houses in an Art de la Guerre (ADLG) tournament and they drew one or two nice compliments. This prompted me to update this post and build two more houses. Considering it took me nearly eight years to build numbers four & five, I wonder if I will ever get round to building the sixth and final one? I'd also like to add that the original three pieces have lasted really well. The edges of the houses needed a little care and attention, as did the edges of the circular bases, but other than that they are just fine.